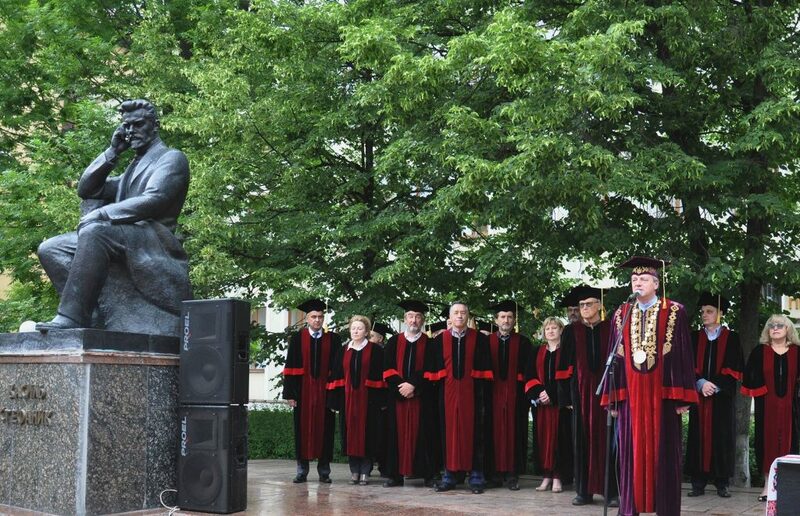 The Cultural Event was held in Vasyl Stefanyk Precarpathian National University to commemorate the birthday of Vasyl Stefanyk, the famous Ukrainian writer and politician. Ihor Tsependa, the Rector of Vasyl Stefanyk Precarpathian National University, the members of the Academic Council, the lecturers and the students took part in it. Vasyl Stefanyk Precarpathian National University has become an important educational and scientific centre not only in the Precarpathian region but in Ukraine. It is one of the best universities in our country. The higher educational establishment is known for the students who are the specialists in Robotics, History, Languages and some other spheres. It has become possible due to the work of the highly qualified professors of the university. Recently Ivano-Frankivsk has got the Prize of Europe, a very prestigious annual award. The staff of Vasyl Stefanyk Precarpathian National University have contributed to it. It should be admitted that the university cooperates with 40 universities of the European Union. Besides it has close relations with the higher educational establishments of the USA, Turkey and China. Svyatoslav Kyyak, the Professor of the Department of Philosophy, Sociology and Religious Studies prayed for the University. After that the participants of the event honoured the memory of the rectors, the vice-rectors, the lecturers who are not alive with a minute of silence. The students laid a wreath at the Monument to Roman Guryk, the Hero of the Heavenly Hundred. Ihor Tsependa presented the best lecturers with the Diplomas of Honour. The Student Centre of Culture and Leisure organized the event. Then many students took part in the literary “Stefanyk Jazz” and the program “The Star Time of the Precarpathian University”.